Since I’m now doing a ton of keynote speaking in North America and beyond, I decided to take the personal brand imagery to the next level of polish. Here are the nine areas I’ve recently changed. 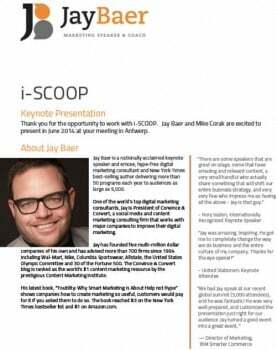 Mikey Mioduski put together a brand-new layout for the JayBaer.com site. I tried to keep it very clean and make it exceptionally easy for meeting planners to find the key information they need to make a decision. We also implemented a lot of embedded videos and testimonials and calls-to-action. The site was built by Greg Taylor and his team at Marketing Press, and included many custom widgets and other tools that not only make the site very mobile-friendly, but also allow me and the team to add testimonials, videos, photos and other “special” content easily. Greg and his folks will be writing a long blog post about all the ins and outs of the new Convince & Convert site when it’s launched, so you code warriors can geek out on that. The site continues to be hosted (and well, I’ll add) by the guys at Web Synthesis (a Copyblogger joint). They have incredible tech support, and their entire mission is blazing fast, stable WordPress hosting. If you’re serious about this stuff, talk to them. In the speaking business, video is gold. I’ve been working for more than two years on gathering up enough high quality video clips to be able to put together a truly first-class demo reel. I worked with the guys at Simplifilm (who also did the killer trailer for my book, Youtility). This was the first speaker demo reel they’ve done. They did an amazing job I think, and they are going to start offering demo reels as one of their services. To match the new site and new logo, we’re in the process of changing the backgrounds, etc. of all of my main social outposts like Twitter, Facebook, G+, etc. In some cases (like YouTube and Slideshare) we are making all-new channels so that I’ll have one version that’s devoted to speaking under the Jay Baer handle, and a separate version that is more dedicated to thought leadership and consulting, under the Convince & Convert umbrella. (because as you may know, Convince & Convert is 8 people now, not just me). While I of course still use my ConvinceAndConvert.com email address, I have started using a JayBaer.com email address for speaker-related communication, for continuity. We recently moved to Mailchimp for our Convince & Convert (and new JayBaer.com) email. We’ve been happy with our previous solutions, but the ease-of-implementation and connectivity of Mailchimp + Formstack was too good to ignore. We’re still with Feedblitz for RSS. We send out a lot of proposals for speaking and workshops, and Mikey Mioduski put together a much more professional-looking Word/PDF template for my team and I to use in those circumstances. That’s what I’ve been up to, and it’s long overdue. Many, many thanks to the terrific group that worked on all of this, including Jess Ostroff, Lisa Loeffler and Kim Corak from the Convince & Convert team. I’d love your thoughts on any of it in the comments below.